Having read the manual, the typical householder has sufficient knowledge to make a plumbing system safe in the event of a burst or other leak, and to engage a professional without being vulnerable to a plumber who might try to get agreement on unnecessary work. There is also adequate information to enable a much more ambitious approach and to undertake a large plumbing project in the home to replace existing pipes and fit new appliances and equipment. All that the novice DIY plumber requires is attention to detail and a little practice to gain confidence before starting into the job. This really is a very good manual and many readers will wonder why they ever regarded plumbing as a craft skill to be avoided. DESCRIPTION: This manual follows the Haynes tradition of concise, easy to follow text, supported by lavish illustration in full colour. The first question might be – why buy a manual when most people hire a plumber? The simple answer is that knowledge of any subject is valuable when used directly by the reader, and equally valuable when engaging someone to perform the work. This is particularly true when plumbers have a reputation for high charges and blinding the customer with technicalities. Considering the difficulties in some locations of finding a plumber and then having the work done very quickly to plug a leak, it is very helpful to know how to approach the emergency before a plumber arrives and it can save a great deal of cost and time to be able to effect a repair. Plumbing is fairly straight forward and becoming even easier. Once the home pipework has been isolated by turning off the main stopcock, and every homeowner should know where this important piece of equipment is located, and own the correct tool for turning it on and off, working on existing equipment is logical and simple, requiring very few tools. For the DIY enthusiast, pipe cutters, spanners, hammers and other basic tools will probably already be in the toolbox. The tools to cut holes through walls and floors may not be, but a SDS drill and set of tools is not expensive and makes a simple job of chasing out mortar, channels in walls and drilling cores out of walls. The manual covers the three main areas of plumbing, water supply, liquid waste disposal, and heating. The traditional methods of piping and related equipment have been covered very well and this is the area that often deters the novice. Copper piping has traditionally been connected by brazed joints and the use of soldering irons and blow torches can be off-putting until the basic skills have been mastered and confidence built up. Equally intimidating is the bending of copper pipe and cutting it cleanly. Modern plumbing now offers choice. Connections can be made using compression joints that are not difficult to apply, but the alternative plastic couplers are simplicity to fit to copper piping. The DIY plumber could alternatively use plastic piping which is available in semi-rigid and flexible pipes, the latter being very easy to lay without any need to bend piping on a pipe bending tool. Once laid and connected, plastic piping can always be uncoupled to change routes or fit into a new system. The manual explains some advantages and vulnerabilities of copper and plastic, but many DIY plumbers will opt for plastic with its simple tools and ease of installation without a second thought. The choice is even easier now that plastic piping can be used for hot and cold water supply. There is a further advantage because a householder who has copper piping and normally employs a plumber can buy a number of connectors and a length of plastic piping for rapid emergency DIY repairs. In the event of a burst pipe, cutting the damaged section out and coupling a plastic pipe in its place is a simple DIY task that provides a quick repair that can be left long term or replaced later with copper by a plumber. Waste water pipes today are normally plastic in most countries. They differ from plastic water supply pipes in that they either use pushfit components with rubber O rings and gaskets, or require gluing together with a solvent. In either case, they are simple to fit, requiring a few simple tools and little skill. Central heating is more complex and requires a greater range of tools, including test tools to air pressurize the pipes and test for leaks before connection to water. Laying piping is not difficult whether to connect radiators or laying underfloor heating pipes. The main area of complexity will be the installation of the heating device, which might be electric, gas, oil or solar powered. The manual sets out some regulatory requirements but these will vary around the world and some countries may require work to be done by a certified plumber, they may also require Earth bonding to be carried out by a professional and be signed off in an electrical certificate for the home. Where this is not a requirement, it is always wise to check that the home insurance policy does not include a requirement for work to be done by qualified professionals. The manual is comprehensive and includes a section reviewing tools required. Having read the manual, the typical householder has sufficient knowledge to make a plumbing system safe in the event of a burst or other leak, and to engage a professional without being vulnerable to a plumber who might try to get agreement on unnecessary work. There is also adequate information to enable a much more ambitious approach and to undertake a large plumbing project in the home to replace existing pipes and fit new appliances and equipment. All that the novice DIY plumber requires is attention to detail and a little practice to gain confidence before starting into the job. 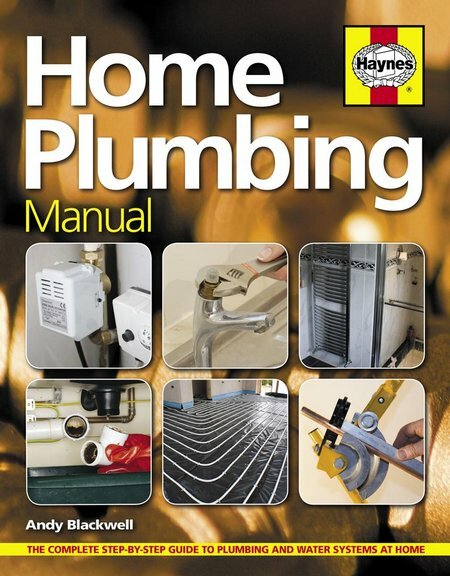 This really is a very good manual and many readers will wonder why they ever regarded plumbing as a craft skill to be avoided.